Five Mile Pass seems to have just about everything. We learned later, however, that the crowds began to show up Friday night, so we may need to move our camp of choice or just go out there on the weekdays. It was a paradise for every machine that we had, especially Shelly's buggy. It seemed to have endless trails specially made, just the right width, height, and difficulty. it had some really fun and challenging terrain for the dirt bikes too. There was this cool little jump right near camp that we all had fun on. Hannah put Brayd's gear on and wanted to ride his dirt bike. Friday morning Brayden and I went on a buggy ride that didn't end so well, We were having all kinds of fun in and out of ravines, jumping etc. On one particular berm, I decided to go a little lower for fear that I would slide out of the top. We slid into the berm where the tires caught on the lowest point and flipped us. I put my arm out for a short instance(instinctively). I believe that while I was pulling it back in, it got caught on the seat belt and the berm hit my elbow and snapped my humerus. The seat belt didn't allow my arm to give at all, and it snapped it REALLY GOOD. At first I thought that the bar on the buggy broke it, but I can't figure out how it could have. When we came to a stop, we were on Brayden's side of the buggy and the buggy had his arm pinned. I was on the top side and could see my arm dangling between me and the steering wheel. It was bleeding quite a bit as well, and for a moment I thought for sure that I had lost my arm. Brayden was screaming to get the buggy off of him, so I grabbed my arm and fed it up and through the seat belt. When I did this, I was surprised to find that I still had feeling in the arm, and it was attached much better than I first thought. I got out and lifted the buggy off Brayden with my body to release him and knelt down and supported my arm the best I could until help arrived. I nearly passed out, but was able to hang on until the chopper arrived. The surgery went well. 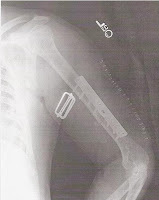 They inserted a stainless steel plate with seven screws. One picture has part of my sling in it. (there is not a curler in my arm) They made me a special sling to help me use my fingers while the nerve heals.